Keep your ride essentials close at hand with the Backcountry Top Tube Pack. Designed to sit securely at the junction of your top tube and head tube, this bag provides a great place to keep items that you like to have easily accessible like snakes, tools, and the like. Perfect for everyday riding or as an addition to a touring or bikepacking setup, this ruggedly constructed bag is ready for any trip great or small. The Backcountry Top Tube Pack is available in Regular (0.5L, 65g) and Extended (0.8L, 100g). I use this on my commuter bike to hold glasses, keys, and phone. I got the extended size because the other smaller one does not hold that much. This is long enough for a glasses case. I've used it in the rain and it kept stuff dry. The zipper is self-sealing. Perhaps in a really long rain ride things might get moist, but you can always use a ziplock inside. 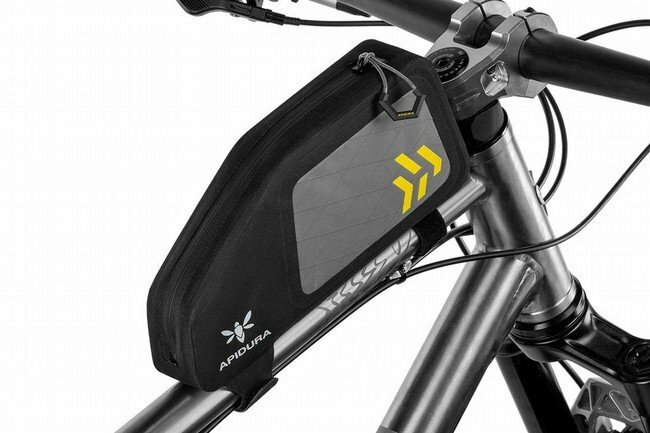 This top tube bag looks great and works great. I love being able to eat snacks by just unzipping the bag and reaching down. That being said, after just 2 rides the fabric that is against the stem has started to fray, which makes me question its durability. There should be an extra patch in this weak spot to help protect the bag like there is on the saddle bag. I ended up buying gear repair tape to put in this area to keep from further abrasions. Hope it helps. Motivation for purchase improved during-the-ride gear accessibility (as opposed to under-the-seat saddle bag or stuff random in jersey pockets), target items granola bars, cell phone, maps, gps, cash, etc. I got the XL bag thinking it would be substantial in size, but I can say it is just enough in size to stuff a guy's wallet, a two-pack granola bar or two, and a cell phone in. I can't imagine the smaller version being very useful. Too small for a bike pump when both below-the-frame spots are allocated for water. I may be able to add a foam block to beat the right list issue. The list is about 34 inch, regardless of wind. I have a very large tube and would imagine it would only be worse with a smaller tube. I still like it, but the listing issue is reason for lowering the value rating, the designers should have gotten that right out-of-the-box. Really good ripstick attachment straps and water resistant zipper is good too. I should have bought the larger size. Great qualities and solid but this is smaller than what I thought but you can put for tube and repair kit. Anyway, I am really satisfied it and this is good for short temp trip or commuting. This top tube bag is very well made had very light. I bought a regular (small) size for use on shorter top tube dropbar bikes, so it doesn't get in the way too much when stopping and standing over the bike. It has enough room for a regular size iphone 6 (definitely not long enough for the PLUS ones), a wallet, and maybe two energy bars. The main issue I have is that the bottom strap interferes with the same brand frame bags I have... 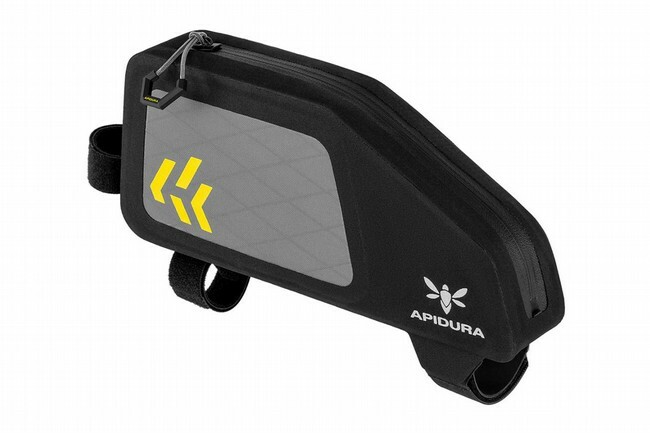 I have three Apidura Backcountry frame bags, one full frame in small size, two half frame ones in small and medium, and they ALL have the same issue... Maybe it won't have the same issue with the extended (long) version of the top tube bag, or if your frame bag allows you to move around the top straps. By the way, Apidura's Expedition line frame bags do allow different positions for the top straps, but I tend to go with the Backcountry line for the light weight. Nice, well made, light, stylish. Worth the money. This is the second one I've purchased. As I stated above, the top tube pack is light, well made, and stylish. It functions very well at the other end of the top tube fastened to the seat post. The only consideration to be aware of is if there is not much space between the headset and the stem you may have a hard time attaching the front strap as it is wide and positioned in the center. I have been looking for a top tube pack long enough for my cell phone to fit into, but skinny enough that my legs don't hit it when i pedal. this is perfect! This bag was exposed to relentless sun, downpours, and abrasion throughout southern Mexico. So far it has no signs of wear aside from a few stains. Very satisfied with the durability and look of the bag.